Last time around we covered one half of the titular Rick and Morty duo; today we'll complete the duology! "On one of our adventures, Rick and I basically destroyed the whole world, so we bailed on that reality and we came to this one, because in this one, the world wasn't destroyed and in this one, we were dead. So we came here, a-a-and we buried ourselves and we took their place. And every morning, Summer, I eat breakfast 20 yards away from my own rotting corpse." While the Rick figure from this line was a fine offering, Morty is unfortunately the polar opposite, so let's get this out of the way early: Morty is very much an inferior figure and the worst from this first series. But you can't have a Rick without his Morty or a Morty without his Rick, so let's take a closer look here. The first problem is the scale; Rick is constantly shown to be a very tall character in the series, so his 5½" size suited the 5" scale nicely. In the show, Morty usually comes up to his shoulders. Problem is, the Morty figure here comes to 4½" tall, making him problematically out of scale, and his sculpt is also a lot bulkier, which doesn't make any sense. I knew about his unfortunate height in advance before I ordered the figure, so I was warned, and was looking to customize the toy by slicing out a part of his limbs and midsection to shorten him. Problem is, the figure doesn't need to be shrunk, but needs to be downscaled to fit with Rick. He's just too big. To be fair, the effect is worse in photos than in person; looking at the duo together on my desk, it isn't terrible, but it is certainly notable and will grind a lot of people's gears. Morty's sculpt is simple and mostly fine; this is definitely the Morty we know and love from the series. But he shares the same sloppy paint as Rick, which lets him down, especially around the eyes. That's the worst part: the slop gets in the way of his scared, wide-eyed expression, and you need to ensure the pupils in his eyes are in the right place to look normal. You're definitely going to want to inspect these guys on the shelf before you decide to buy one to make sure you get well-painted eyes. But the rest of the figure's paint doesn't fare well either; for whatever reason, these figures all seem to have an unfortunate gloss finish, which isn't as troubling on most of them, but having Morty's shirt reflect light sharply doesn't gel with the look. It's odd. Morty shares Rick's articulation, for better or worse: balljointed neck, rotating hinge shoulders and legs, then pegs at the knees and elbows, and finally cut joints at the wrists and shoes. Because of his bulkiness, Morty has a more difficult time standing than Rick, and because his neck doesn't exist his balljointed neck joint is a little useless. 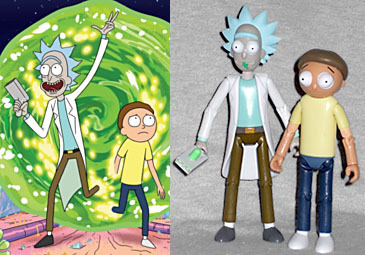 Again, it's not terrible, but the stuff that lets it down is worse than Rick; there's points on the Morty sculpt that would allow for joints at the shirt sleeves, but they are frustratingly absent and leave him not as articulated as he could be. 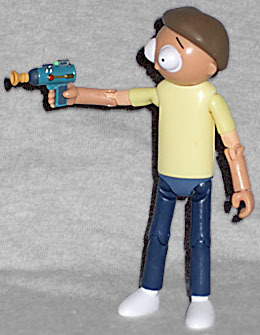 Aside from the Snowball Build-a-Figure piece, Morty comes with a ray gun like the many we've seen across the series, and that's it. It's a let down. If cost was a factor here, I wonder if the toy might have been shrunk down to save on the cost of plastic, and allowed for some extra accessories from across the series. Morty is the worst in this series, and the closest of the lot to a "bad" toy. Personally, while I am let down by this figure, I don't dislike it; on my desk, the duo look quite good together, and I am really pleased to have action figures of these two. With collecting the way it is nowadays, plenty of very-figure-worthy characters never see toys; while these Rick and Morty toys might not be the best they could be, they're still pretty good and an excellent buy at their cheaper pricepoint.